NATIONAL CHAMPIONSHIP SHOW 2018 - COW TRIAL! 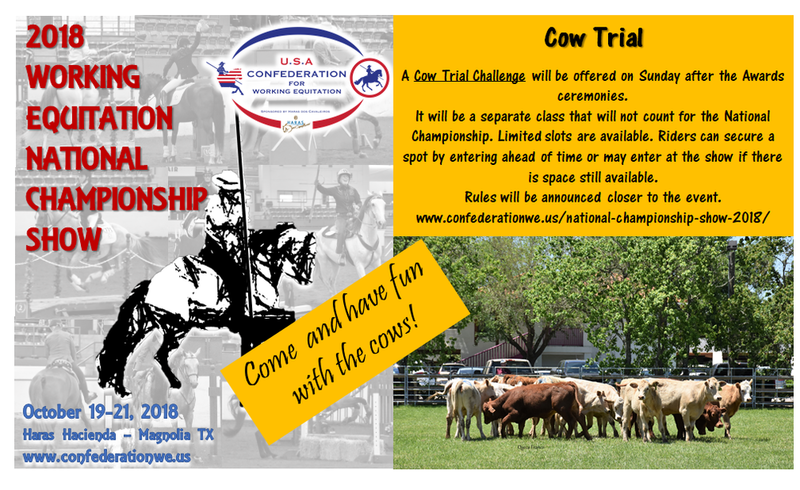 A Cow Trial Challenge will be offered on Sunday, October 21st, after the Awards ceremonies. It will be a separate class that will not count for the National Championship. Limited slots are available. Riders can secure a spot by entering ahead of time or may enter at the show if there is space still available. Rules will be announced closer to the event. Newer PostNATIONAL CHAMPIONSHIP SHOW 2018 - INTERNATIONAL RIDERS INVITED!